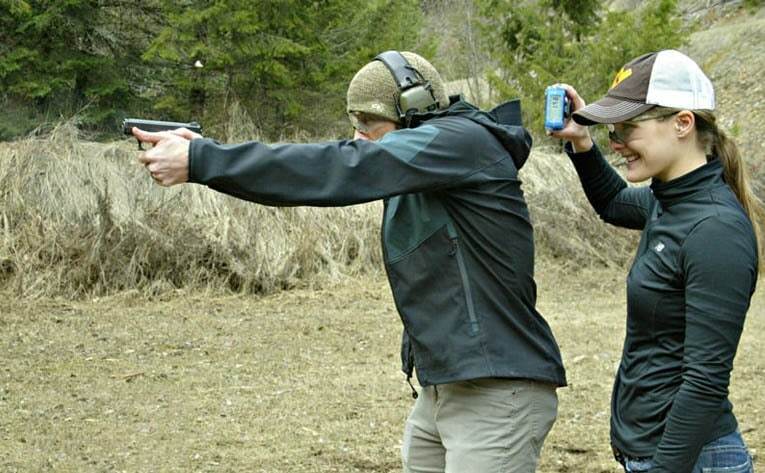 When it comes to gun shooting, one of the most essential training gears is a shot timer. Whether you are a pro shooter trying to fine tune your shooting skills, or an amateur ready to be molded, this will be a crucial tool that helps augment your skills. If you are training for a competition or for self-defense, you know timing is critical. This is exactly where a shot timer comes into play, as it allows you to determine the time you take for drawing and shooting, the timing between your shots, and your transition time. What is a shot timer? If you are new to this field, you should first understand what a shot timer is and its importance. Start Delay – after the go button is pressed, this feature enables the start beep to go off at a time you set. This can also be set for a random interval. Par Time – with this feature you can set a start and a stop beep. Review – this function will provide you with all the information for your current shot. If you are out looking for the best shot timer, you would probably know how difficult it is to make a choice from the numerous models available out there. Like with any other product, choosing the right shot timer will certainly be a confusing issue for all, amateurs and pros alike. The basic purpose of a shot timer is to provide you with access to all the information and data you would need during your training session. Therefore, the display of the shot timer should be the number one feature you look for in any model you choose. A shot timer will basically record your time in order to display the necessary data, and it is also designed to instruct you to start your training by providing a signal. Hence, when you choose a shot timer, you need to take into account the clarity and reliability of the display feature as well. The shot timer would be one of the most highly used training gears you have. Therefore, when selecting a shot time, you need to make sure that the device has a long lasting battery life. This particular feature will also help determine the maximum potential and efficiency of the device. The main reason for using a shot timer is to gather data regarding your shooting training and use it to make improvements wherever necessary. So, a shot timer’s ability to record data is another vital feature you should look for. Look for the data recording as well as the storage capabilities of different shot timers before choosing one. Similar to any other shooting gears and accessories you have, your shot timer should also be durable enough to endure ruthless and unexpected weather conditions. Apart from all the features we have listed above, knowing that the shot timer you choose is of great quality and highly durable is what will make your investment completely worth it. From the most popular and trusted brand in the world, Competition Electronics, the Pocket Pro Timer II is one of the brand’s long list of reliable and efficient gadgets. This particular shot timer model is one of the most talked about pieces, and one of the main reasons why many prefer this gadget is its ease of operation. The shot timer is designed with three configurations of display, all of which are easy to access regardless of whether you read it from your belt or the bench. The company has also put in extra effort to make the screen readable both during the day under direct sunlight and also at night. With this model of the Pocket Pro Timer II you can use three different configurations: Single Time Only – to know about your last shot and battery status; Rounds Per Minute – displays date/time, battery status, number of shots, start delay setting, first shot, and last split, in addition to rounds per minute, and; Review Direct – displays last split, last shot, first shot, date/time, battery status, number of shots, and start delay setting. The shot timer definitely comes feature packed, and also provides great remarks for your progress. When you hit the start button, the device will automatically clear the previous string so that you can save new data, eliminating the need to clear the string manually. Competition Electronics have designed this shot timer in the right size, as it will fit comfortably in your hand. While there is a button you can press to turn off the timer, it also has the function to automatically turn off if left inactive for ten minutes. The belt clip is large enough to fit any normal sized shooting belt. The start buzzer can be heard through your hearing protection, which is exactly what we need from a shot timer. One issue with the Pocket Pro Timer II, though, is that it consumes battery life faster than you would expect. Also, many users of the gadget think that it feels a bit flimsy, especially after handling high quality weapons during training. And if you practice shooting in a busy place, your device could pick up others’ shots as well. The Pocket Pro Timer II CEI001 is available in two different colors: blue and grey, and comes with a 2 year warranty. Three easily accessible configurations of display. Large and easy to use buttons. Could pick up other shooters’ shots during a bust training session. 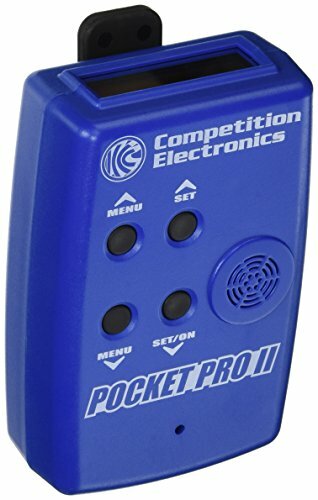 The Pocket Pro II Timer CEI4700 is another offering from Competition Electronics, but this particular shot timer model is known to be better than its counterpart, the CEI001. What attracted us to this shot timer is the fact that it has been preferred by several first time shot timer users. Yes, this shot timer model also comes with three different configurations of display, and similar to the previous model, the display position of this device also makes it easily readable both from the table and your belt. The display is also clear during the day as well as at night, so you will have no trouble reading your data whether you choose to train outdoors or indoors. The three configurations of display in this unit are the same as that of the CEI001: Single Time Only, Review Direct, and Rounds Per Minute, and their functions are also the same. When it comes to the data recording feature of this device, we couldn’t help but notice that there were varied reviews for this feature in particular. Unlike the previous model from the company, this shot timer does not have a clear memory feature that automatically clears all your previous shots data; therefore, unless you remove the battery and reset the device, you will not be able to start with a clean slate. This certainly makes things completely inconvenient, and sometimes even frustrating. The Pocket Pro II Timer CEI4700 comes with an independent shot sensor and buzzer, which makes sure that you receive excellent performance from the gadget every time you use it. The overall menu is intuitive and it is easy to navigate around. The buttons are designed to be large enough to make access and use easier, even for those with big hands. The large belt clip lets the device sit comfortably on any belt, and the timer also turns off automatically when not in use for ten continuous minutes. The buzzer is powerful enough to transmit through your hearing protection, perfect for target and other shooting practice. As expected, there are a few issues with this shot timer as well. Firstly, the battery itself is known to be quite loose inside the housing and therefore jiggles sometimes. You will have to fix this issue by using a tape or any other means to keep the battery in place. The shot timer is also very light in weight, a feature that some users like, but makes others question its durability. Once again, this shot timer is also known to gather shots from others, and hence could get confusing when you review your data. The Pocket Pro II Timer CEI4700 comes with a two year warranty. Three different configurations of display. Independent buzzer and sensor for optimum performance. Battery is loose inside the housing, and rattles. Doesn’t clear previous shot strings automatically. The Pocket Pro shot timer is another successful model from Competition Electronics that is known for its durability, design, and features. This shot timer will be a great addition to your shooting gear and accessories, and can be used for scoring matches as well as for personal training. With its timeless design, this shot timer model from the well-known brand has certainly set the bar for shot timers. 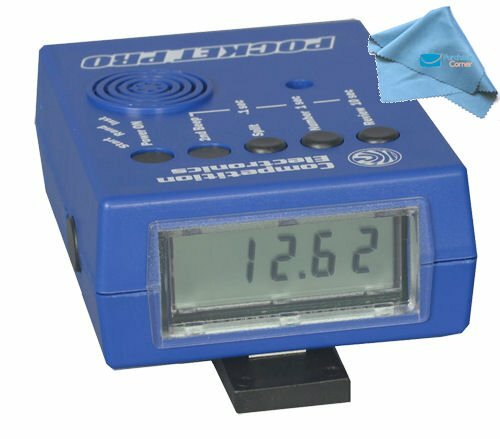 The display of this top rated shot timer is quite large and in a numeric segment, making it easy for you to read data when you are practicing outdoors. As a matter of fact, the numbers are .5 inch tall and therefore are easily readable. Honestly, of all the models we have discussed so far, this Pocket Pro Shot Timer has the best display and should be your choice if you constantly practice shooting in the outdoors. The shot timer is designed to enable you to review up to 50 shots, whether in the forward or reverse order. For the review, you will have data such as shot number, split times, and shots displayed on the screen. While this model does not come with three configurations of display like its counterparts, it still works great and is also a widely preferred shot timer models on market today. The ergonomic design of the gadget makes operation easy, both for left and right handed shooters, without covering the sensor and buzzer, thus minimizing discomfort. The automatic power down feature helps you save battery life by automatically turning off the device if left inactive for ten minutes. The large belt clip makes it easy to hang the shot timer on your belt, and the par time in this model is set by a second beep which signifies your time limit. With this shot timer, you also get the ability to adjust sensitivity. The battery life of the Pocket Pro shot timer is similar to other models from the company, 20 hours. But, what makes it even more interesting is the low battery indicator that lets you know when it is time to charge your device or replace the batteries. Above all, the Pocket Pro shot timer is perhaps the only model that hasn’t received a negative comment from previous users. This simple fact makes it evident that this could be the best shot timer you are looking for. The device comes with a two year limited warranty. Comes with a low battery indicator. Enables both forward and reverse review. The PACT Club Timer III is carefully designed with its focus on teaching users what they need to know about their shooting skills in an easy and direct manner, enabling them to focus on what’s important rather than playing around with their shot timer. The shot timer will display all the information you need to know, in the form of strings, without having to push a button. The gadget carries a unique design and all the buttons are right where they should be, preventing unexpected activations. The large multi-function display of the PACT Club Shot Timer 3 highlights the total time and shot number with first shot and last split time displayed without the need for pushing a button. The gadget also displays PAR time simultaneously. The timer has a rugged design, is simple to operate, and is equipped with all the features you would need for practice, without any advanced training software. The easy-to-read display of this shot timer functions in three different modes: Set Mode – allows you to switch between Instant Mode and Delay Mode and also clear or enter a PAR time; Review Mode – displays cumulative times from your first to last shots, and; Timer Mode – displays the total number of shots you have fired and the time between those shots. The timer automatically shuts off when left unattended for fifteen minutes, which when compared to the time of the previous models discussed here, is a bit high. 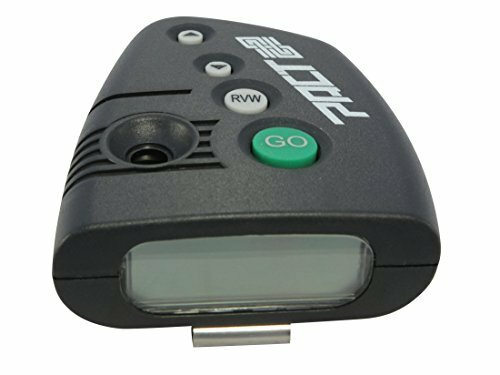 If you have been on the lookout for a shot timer with loud buzzer, you would be definitely pleased with what the Club Timer 3 has to offer. Even if you are practicing during a busy day, you are most likely to hear the buzzer, which is one of the major benefits of this shot timer model. The overall size of the shot timer has been determined cleverly so that it fits in your hand. The microphone and the buzzer fall on the side of the gadget to make sure that you don’t accidentally block them with the touch of your hand when using the device. Furthermore, all the essential control buttons are placed down from the shot timer’s face, eliminating the chances of accidental pressing of the buttons. Even when you want to use the buttons, their natural location will make them easily accessible with your fingers, so you no longer have to keep searching for the GO button during practice. The facts that the gadget has no mechanical buttons that could possibly fail and the rubber keypad is designed to be waterproof make the PACT Club Shot Timer III a great choice. The Club Shot Timer III has a Delay Mode with which you can set a delay anywhere between 2 and 3.5 seconds before the loud buzzer rings. If you choose the Instant Mode, you need to press the large GO button, and you will hear the loud buzzer after you let go of the button. Yes, there are a few shortcomings. Some users feel that the shot timer is not highly user-friendly, and others seem to be disappointed with the gadget’s low memory, relatively high cost, and high sensitivity of the microphone. The PACT Club Shot Timer 3, unlike the many other models available today, has a lifetime warranty. Competitive Edge Dynamics (CED) is one company that has seen a lot of progress in the shooting community and the shooting accessories industry. They have now set the standard with their uniquely and efficiently designed chronographs and shot timers. Their products are being used by several law enforcement and military agencies around the world, and with this credibility, comes their famous shot timer model, the CED 7000. Designed specifically for the pros in shooting, the CED 7000 is one of the most compact shot timers you will find on the market. But, don’t be fooled by the looks because, this one really packs a punch in terms of design and features. The gadget comes with a large LCD display that makes it easy for you to read data and also a variety of other useful information, such as time, split times, total number of shots recorded so far, and also the battery life. The device has memory enough for storing around ten strings at a time, of course with unlimited shots for a single string. You can easily retrieve any information you need using the centre button that functions like a joystick and monitor your progress in training. 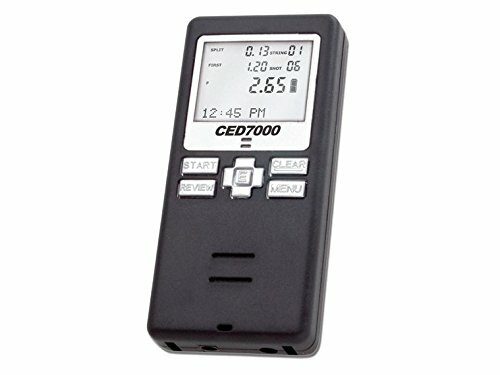 The CED 7000 shot timer delivers its start signal, a beep, at 100dB, making it difficult for any user to miss or ignore the same. Yes, you can adjust the volume to your liking and depending on your environment. You can also set instant start times, random delays or par times. The shot timer can also be used as a conventional stop watch to record time during non-shooting activities. An absolutely unique feature in the CED 7000 is what they call the Spy Mode, with which you can easily monitor the shots fired by your fellow competitors and visual starts. The lithium-ion battery used in the gadget is known to function for about 28 hours constantly, when fully charged, which shows that this is one of the few devices with excellent battery life. The device comes with a neck and wrist lanyard, which makes it easy for you to carry it around. However, unlike the other shot timer models we recommended, this one doesn’t have a belt clip in the package; but, you can buy one separately. In addition to the belt clip, you can also purchase various other accessories such as a wrist band, color skins, retractable neck lanyard set, screen protectors, auto charger, custom case, and external battery pack, based on your need and the level of convenience you expect to have. Despite so many amazing features, the CED 7000 has its own set of flaws. There is no solid button to turn the device off when necessary, and though the battery is known to function longer for some users, it still has to be fully charged in order to attain its potential. The CED 7000 has a two year limited warranty. Functions in different modes, including a stopwatch. Battery needs to be fully charged to keep it going.